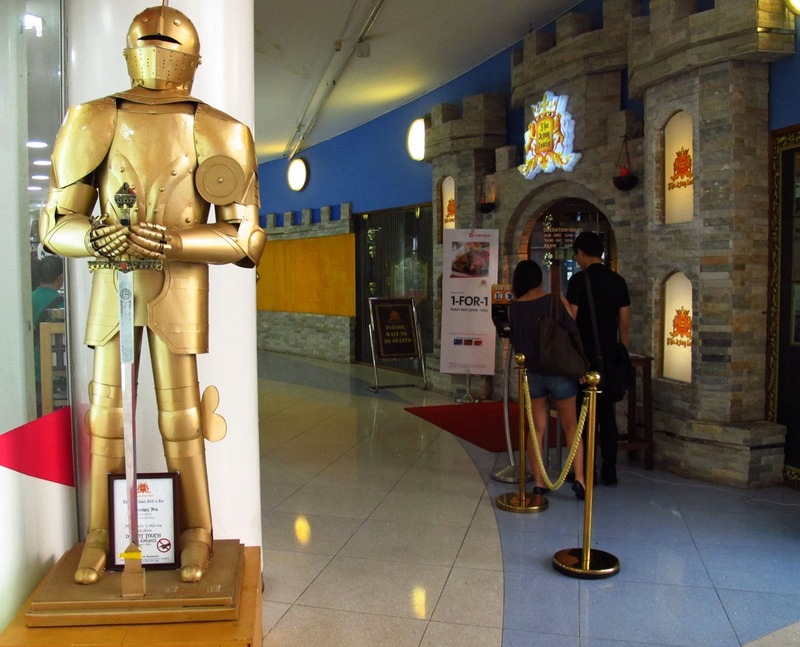 On the third floor of Vivocity, next to Daiso, is The King Louis. Famous for their platters and banquets, it is a good place to take your friends for a raucous time of fun. As you take the escalator up, you see the imposing presence of fully-armoured medieval knight (a mannequin, of course). Another of his steel-clad comrade stands in the centre of the restaurant while several shields are hung all around the restaurant. The dimly-lit setting, with just the right amount of ambient lighting, coupled with a clear view of Sentosa, makes for a dramatic sight as you walk through the doors. As you sit cozily around the table with your friends, the relative darkness give the illusion of privacy, great for girls' talk! When we arrived at about 6.30 p.m. for dinner, several other tables had already been occupied. Very quickly, we placed our orders: Banana Bacon Bites, and Knight's Signature Potato Skins for starters; and the Queen Isabelle and Knight Constantine banquets were our mains. 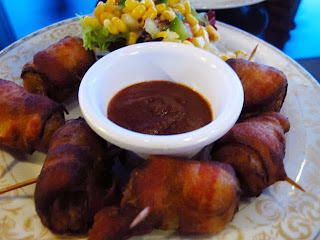 The Banana Bacon Bites were just that, banana chunks rolled in bacon and then deep-fried. It came with barbecue sauce and a bowl of side-salad. A serving consists of 6 banana bacon bites each slightly bigger than my thumb. They were quickly dispatched of. The Knight's Signature Potato Skins were also 6 bite-sized morsels. 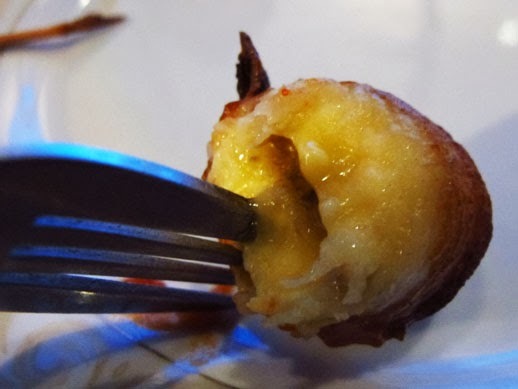 These tasty deep-fried snacks with mozzarella were also snapped up quickly. The Queen Isabelle came shortly after. 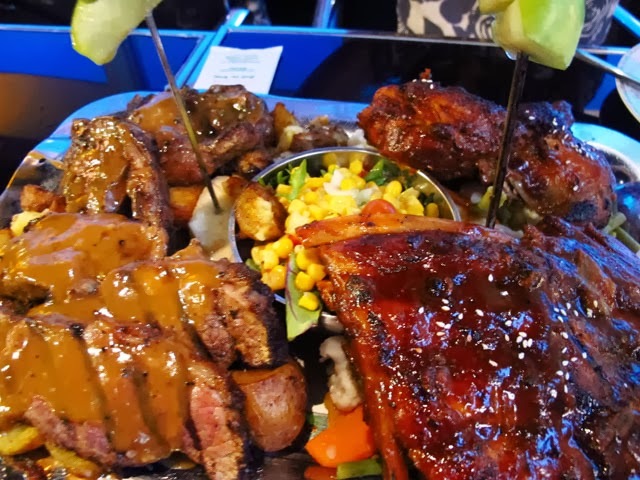 A bed of boiled carrots, beans, and cauliflower lay at the bottom of the platter while grilled beef, pork ribs, pullet, and lamb chops took pride of place. The Queen Isabelle is available in 2 portions: for 2 to 3, or for 4 to 5 pax (we ordered the smaller one). The grilled beef was lean, moist, and tender. As the platter we ordered was meant for a party of 2 to 3 persons, it came with 4 slices of beef. The lamb chops were similarly tender, though I personally would prefer them to be more generous with the herbs. I get frozen Spanish pork loin ribs and I ask for them marinated. Or you can use a dry rub consisting of cayenne pepper, dried thyme, garlic & onion powder, freshly ground black pepper before using barbeque sauce on the ribs. Wrap the ribs tightly with 2 layers of aluminium foil and pop it into a pre-heated oven at 130C for 2.5 hours. After that, take it out of the oven and open up the foil. Glaze the ribs with your favourite barbecue sauce and return it to the oven at 170C for another 20 minutes. 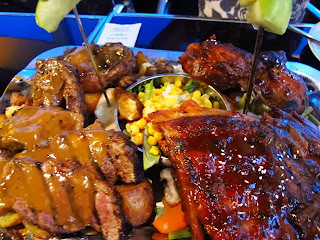 You will get tender, juicy and tasty ribs! I make my own "barbecue" sauce: some Worcestershire sauce, some ketchup, minced garlic, some crushed white & black peppercorns. 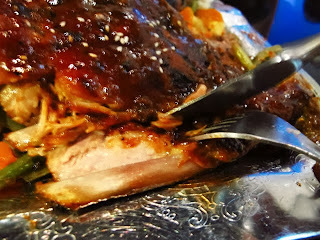 We also have the Wild Appetite barbeque sauce sold in our store which is to die for. Check it out when you come next time! The Knight Constantine Banquet, a seafood platter on a bed of vegetables, came a while after the Queen Isabelle. 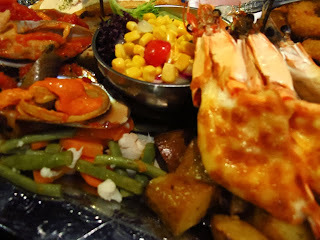 The King Prawns with Australian Cheese were fresh. The deep-fried fish fillets were slightly soggy by the time we got to it due to the cream sauce slathered on the fish. The green mussels and calamari rings were similarly tasty. After a very full dinner, 5 of us shared a Hazelnut Daqouise and a Chocolate Mousse Cake. Though both cakes took a while to reach us, it was a sweet ending to a hearty meal. The King Louis is a suitable place for big gatherings, where friends interact over shared platters, and the most important ingredient is fun. Go there with an empty stomach and a heart full of laughter, and you should have a great time!